The new Ryson Dual Track Spiral Conveyors are the ultimate in space savings. Two tracks operate independently within one spiral structure. Both tracks can go up or down, and can optionally be reversible. Only one drive motor is required for each track, resulting in substantial savings in energy, controls and systems integration. The Dual Track Spiral conveyors build on the already proven Ryson Spiral Technology and are designed for low maintenance and long life. Ryson Spiral Conveyors need less floor space than conventional conveyors and are faster and more reliable than any elevator or lift. See some examples of the Ryson Dual Track Spiral. Models with dual 6”, 9”, 12”, 16” or 20” wide slats are available. Some site assembly is required for models with 16” and 20” wide slats. This innovative arrangement enables a low friction operation for the spiral conveyor. The slats are supported by precision steel roller bearings which ride on a polyurethane surface. This arrangement effectively takes up the side forces created by a tight radius and at the same time increases the load carrying capacity of the chain up to 75 lbs. per linear foot. This enables the spiral conveyors to start and stop fully loaded and facilitates high speed, low noise and long life. The slats are made of a fiberglass reinforced nylon composite and are available in widths of 8″, 12″, 16″, and 20″. The slats can also be furnished with friction inserts when additional grip is required. The dual spirals are available in 4 basic standard configurations (A, B, C and D) and will accommodate most requirements relating to the location of the in and out feed tangents. All configurations can operate up or down in a clockwise or counterclockwise rotation. 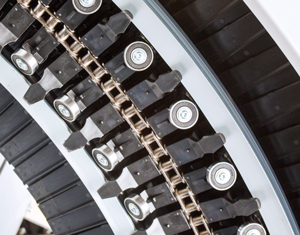 C-EX configuration matches the centerline of the top and bottom conveyor centerlines. 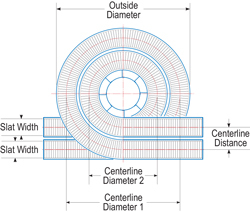 Centerline offsets can also be accommodated. B-MA is an example of modified in or outfeed angle. The modified angle is normally 45 or 30 degrees, but other angles can be provided. A-EX show extended in or outfeed tangents which can be straight or curved and can accommodate centerline off-sets. The two tracks of the Dual Track Spiral Conveyors do not have to feed in and out of the spiral at the same elevations, and can be applied very effectively to multi-level order picking modules or similar applications. The outside track serves the first level and the inner track the second level. In the examples to the right, the space savings is considerable if you consider that you get two spirals in one compact footprint. For more details on the Ryson Vertical Conveyors, please visit our Ryson YouTube Channel, or read current news and installation stories on the Ryson Blog. 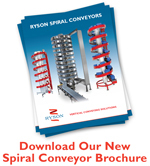 Download the information on the Ryson Dual Track Spiral Conveyor here.